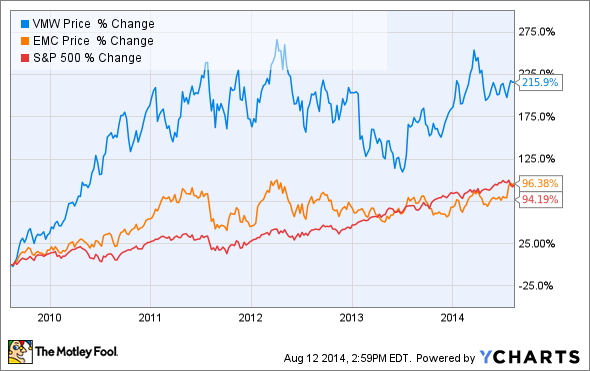 VMware shares have crushed the market over the past five years but stagnated in 2014. These three catalysts could restart the stalled growth chart again. VMware (NYSE:VMW) has been good to patient investors. The stock has gained only 10% year to date but has more than tripled in five years. In the longer period, VMware has outperformed corporate parent and majority shareholder EMC (NYSE:EMC) as well as the broader market. Is VMware running out of growth drivers, or should investors expect more of this stellar long-term performance in the years ahead? There are arguments to be made on both sides of that query. Today, I'll take a closer look at three of VMware's most bullish features. Some investors believe that companies should leave share repurchases alone. Investing is for investors; Running the actual business is what management and directors do best. If I just described you, dear reader, feel free to jump ahead to the next item in this short list of VMware's share price drivers. Still here? Then you probably believe that VMware itself is uniquely positioned to know what's ahead for the business, and whether the stock is undervalued in relation to the upcoming puts and takes, because VMware doesn't just have a solid history of generous buybacks -- the company is stepping up its share repurchasing efforts even further right now. Except VMware isn't exactly following that strategy these days. Last summer, VMware set up a $700 million buyback authorization, to be executed over the next 18 months. That was a big step up from the previous $250 million authorization, but the company wasn't finished. Last week, the company added another $1 billion to the unused bits of that old $700 million order. In other words, you should expect the actual buybacks to accelerate again over the next few quarters. 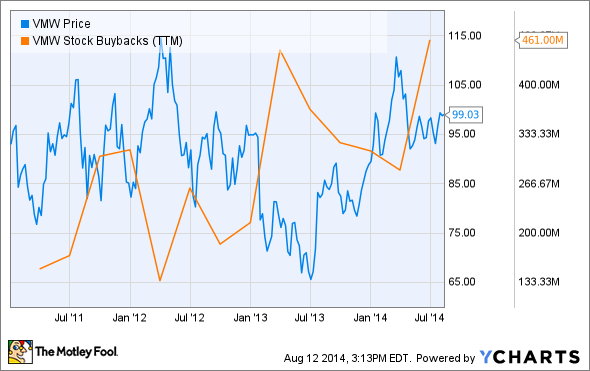 Supporters of share buybacks would say that VMware expects good things to happen here. Throwing good money after a falling stock is an ineffective use of cash assets, after all. In this view, the only justification for stronger buybacks is a respectable return on the investment as share prices rise. Don't forget that we're talking about roughly half of VMware's free cash flows getting earmarked for buybacks. It's a significant investment, not a fancy-free whim. Exhausting this order should reduce VMware's share count by more than 2%, all else being equal. But of course, everything is never quite equal. VMware started selling its own software-defined storage system last quarter, and it already has more than 300 customers using the new platform. The virtual-computing specialist has always relied on other storage solutions with EMC front and center. This product distances VMware from EMC just a little bit. It also lets the company do more of its own heavy lifting when it comes to providing complete virtual computing and cloud solutions. Speaking of cloud computing, VMware announced a joint venture with Japanese telecom Softbank at the end of July. This service is the company's first vCloud hybrid cloud product in Asia, and it will be available to Far Eastern customers in the fourth quarter. But the Softbank venture won't be alone for long. VMware also introduced a hybrid cloud service for the Chinese market in partnership with China Telecom. This one will be open for business in early 2015. That's just scratching the surface. VMware is getting busy in new product categories and international expansion. That one-two punch is a good way to stay relevant and growing in the ever-changing IT market. Last but not least, VMware might not be joined at the hip with EMC for much longer. Activist investment fund Elliott Management has built a $1 billion stake in VMware and is using this investment to break the company apart from EMC. When EMC spun out VMware as a separately traded stock, the storage expert held on to 80% of VMware's shares. 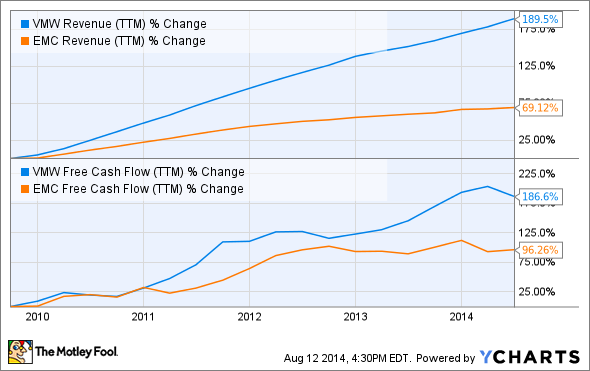 VMware is a rapidly growing innovator, and EMC is a far more mature, stodgier value stock. In Elliott's view, EMC is doing a disservice to itself and to investors by holding on to VMware with an iron fist. Spinning out the virtual-computing expert completely would give EMC something like $34 billion of fresh capital -- not a bad return on an original investment of just $625 million. EMC could also elect to sell some of its VMware shares while holding on to a significant stake. Elliott's move is more focused on unlocking value in EMC shares; a complete spinoff isn't likely to move VMware shares very far. But some investors covet the chance to buy larger stakes in VMware, and share prices could rise as these enthusiasts and hedge funds draw up their claims. Going forward, a completely separated VMware would have less of EMC's financial and operational backing but also greater freedom to seek growth by other means.